What Is The One New Year’s Resolution That Will Make You Richer? Yes. This is another attempt to bombard you with a New Year’s resolution suggestion. It is not get thinner, get, happier, or resolve to lose weight. Resolve to take a vacation. Get organized. Buy this or that. So here I am filling your inbox with yet another “get”. In this case I am teasing you with the idea of “get richer”. I apologize in advance but believe this article could change some peoples understanding, which at best could change their lives and at worst just change how they view their finances. So here it is. What is the one New Year’s resolution that will make your richer? Simple answer: Resolve to get out of debt and stay out of debt. Why being out of debt will make you richer is more complicated so keep reading. Most people quickly and easily understand that is they have no debt they don’t have to pay the monthly payments to support the debt. So it follows they will be richer by that amount each month. Yes, that is the easy answer and that is correct. The more difficult realization that most people never confront is what the cost is of maintaining a lifestyle and lifetime of debt. Here is just a brief peep into how our working lives and income are drained away from us over our lifetime due to our reliance on debt. Anyone that has looked at the amortization table on the cost of a home loan realized that depending on your interest rate and loan type it can cost you almost twice the purchase price of a home to pay it off. Example: A $100,000 home over a 30 year loan at 9.3 percent will require a total payment of $202,707.51, twice the loan value. Now I realize that this day and age interest rates are much lower. But do your really know how much extra in interest you are paying on your house? 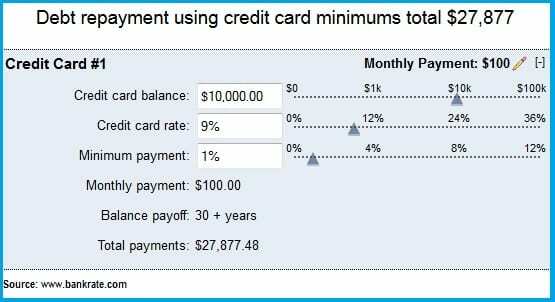 paying only the minimum monthly payment of $100.00 will take 30+ years to pay off and cost a total of 2 1/2 times the amount ($27,877.48). How to do that is a more complicated question. Fortunately or unfortunately, I am a bankruptcy attorney. As my uncle the doctor always said, “If you go to a surgeon, he is going to say “operate”. If you go to an internist, he is going to say “take a pill”. So beware, if you come to me the bankruptcy attorney, you already know my bias and you certainly don’t want a scalpel in my hand unless it is cutting away your debt with a bankruptcy. 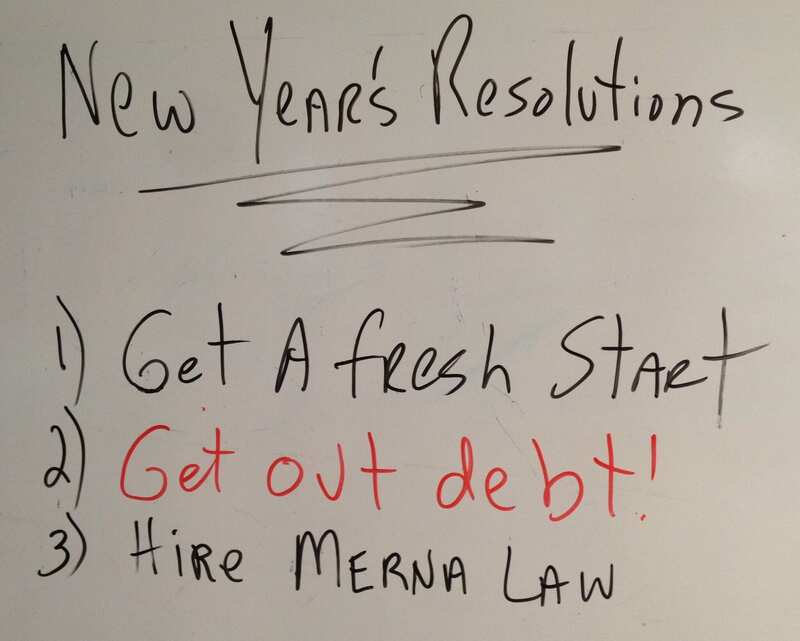 Have a happy New Year and resolve, at a minimum, not to take on new debt this year – just trim it if not wipe it out.